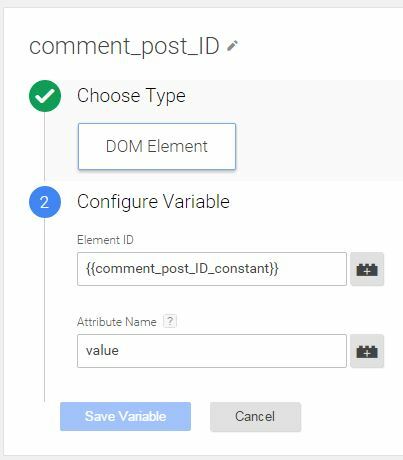 When implementing event tracking of user comments using Google Tag Manager for WordPress I came across a pretty strange behavior when trying to retrieve the value of a hidden <input> field holding the current comment post id (comment_post_ID) that should serve as event label for Google (Universal) Analytics. Below you find the WordPress comment form used by most templates today. Pay attention to line 11 that shows the hidden input field comment_post_ID. This field’s value should be used as event label. If the attribute name is set, the variable’s value will be that of the DOM element attribute; otherwise, the variable’s value will be the text of the DOM element.